Summary 1080p network camera with night vision and 130 degree wide angle lens. Ever since I started cataloging camera footage to my YouTube channel it's been fascinating to see how different one camera is from the next. Sometimes I have high hopes for a camera with an amazing interface, yet it will totally disappoint once I start looking at video quality. Other times the interface might be the most basic, outdated interface a camera could possibly have, but the video is great. Still other times, the video is decent and the interface is good, but I'm left thinking "if it only had this". The YI Home Camera 2 falls into the latter category. For its price and features right now, it's basically a meh product. But with the right improvements, it might be a decent little buy. Anyway, I'm getting ahead of myself. I grabbed the internal views of the camera from the FCC lookup site. Clearly shown is the Ambarella Cortex-A9-600MHz: S2LM processor. The YI Home Camera 2 also has 2 Gb of DDR3 RAM and 1 Gb of SLC-NAND FLASH. Wi-Fi is 2.4 GHz only and 11 LEDs help with night vision. Callouts on the camera are a bit hard to ignore as you get presented with the image below every time you start the YI Home app. Had I purchased this camera, I don't think I would appreciate the ad everytime I start the app. Physical features on the camera itself are very streamlined, including a micro USB power connector and a micro SD card slot under the easily removeable rear cover. Included in the box was the camera itself, Quick Start guide, 32 MB micro SD card and micro USB wall-wart charger. I've included the specs for the YI Home Camera 2 below along side the Nest Cam since YI compares the Home Camera 2 to Nest several times on their site. Setting up the YI Home Camera 2 was easy enough, with a couple of gotchas. The first being that the app wants you to either logi n with Facebook or create a YI account. I opted to go the Facebook route, which was standard enough until the app asked to post to Facebook for me. That had sort of a spammy feel to me. Fortunately, you can just click "Not Now" and continue. Once past the Facebook permission, I was in the app and ready to pair a camera. YI provides a pairing tutorial if you don't feel comfortable enough to hop right in. I ran into the next gotcha here; not huge, but worth noting. 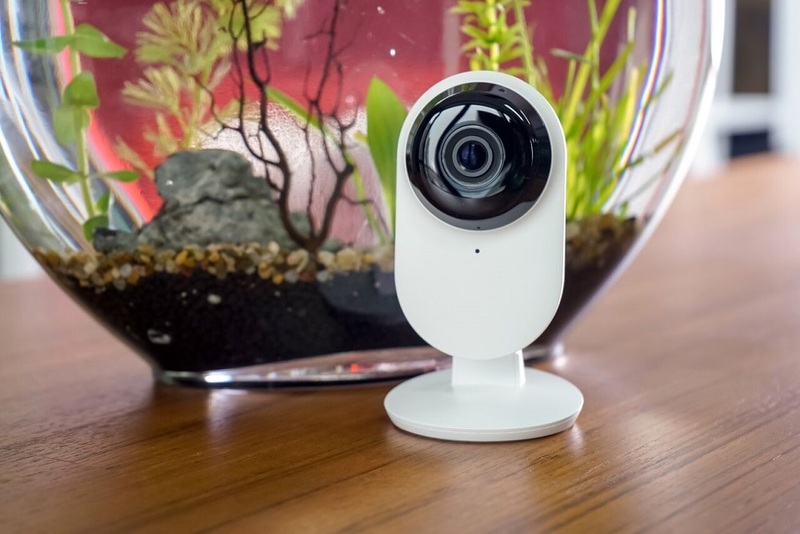 For setup, the mobile device you are using for connection must be connected to the same wirelesss network you want to connect the YI Home Camera 2 to. The YI Home Camera 2 only supports 2.4 GHz Wi-Fi. So if your 2.4 GHz and 5 GHz SSIDs are the same, you'll need to manually make sure you are connected to the 2.4 GHz band. I use different SSIDs for 2.4 and 5 GHz, so I disconnected my phone from the 5 GHz network and connected to 2.4. The YI Home Camera 2 speaks voice commands throughout the process to help you out. From this point, the app presents a QR code, which you hold in front of the camera. The QR code is acknowledged and the camera goes on to connect. For some reason it took me two acknowledgements and attempts before successful connection. You can see by the time on the upper left that setup was faster than estimated even with an unsuccessful attempt. Once the camera is connected, you can switch your mobile device to whatever network you prefer.